Gentlemen, start your steam wands. Louisville has some new champions in town, fierce competitors who face off in heated battles of precision and craft. We’re not talking about ball here — basket-, base- or otherwise. We’re talking about coffee. As of this year, Derby City boasts both the best espresso and the best latte artist in the country. Both plaques reside at Sunergos Coffee, home of winners Aaron Kicklighter and Kenny Smith. Smith in particular has developed a reputation both within the ’Ville and on the national stage as what fellow barista Terry Conder calls “a latte art baller,” creating masterpieces of intricate hearts and rosettas out of espresso and foam. Smith started working with coffee at Starbucks, stopping by Sunergos for his “good coffee” every morning before making frappuccinos all day. “Sunergos was always my favorite coffee shop,” he says. “I think what drew me was the craftsmanship, to see that the people working here really knew what they were doing.” Smith made the switch to Sunergos six years ago. It was also around that time that he and his roommates, all self-described coffee nerds, started holding “latte parties,” going in on a small commercial espresso machine so they could practice their art at home. It’s at these local throwdowns that Smith hones the skills he uses for latte art competition on the national level. Smith first began competing nationally in 2008 at Coffee Fest, an event held annually in Chicago, New York and Seattle. Coffee Fest serves primarily as a tradeshow, where everyone from manufacturers of espresso machines to coffee importers can mingle, but by far the most popular part is the latte art championships. 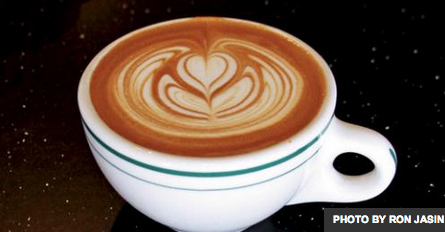 Sunergos boasts three Coffee Fest trophies for latte art, all Smith’s. After four years of competition, he placed second at the 2012 Chicago competition; this year he garnered second place again in New York and third place in Chicago. And, in March, Smith won the inaugural competition at the SCAA Latte Art Exhibition in Boston, coming home with a $4,000 espresso machine and the title of America’s Best Latte Artist. Smith’s co-workers Becky Hayko and Lydia Huested have also competed nationally at Coffee Fest, with Hayko coming in the top 16 at last month’s Fest. Huested, whose father is one of the owners of Sunergos, began competing at the age of 14, first at the Thursday Night Throwdowns and then on the national level. Coffee Fest also hosts the America’s Best Espresso competition, which Kicklighter won this year. While latte art is all about presentation, the espresso contest is judged on taste alone, with each barista being given up to 10 minutes to pull their three best shots. Kicklighter and the folks at Sunergos spent weeks preparing for June’s fest, testing out different roast profiles and brewing techniques for their winning coffee. “We strive to be as unpretentious as possible,” Kicklighter reiterates. “Just doing exceptional coffee isn’t enough to bring people back every time. People want someone who is friendly and inviting.